So much barbecue sauce, so little time. Our box of bottles to try for Barbecue Season 2008 was so heavy, we could hardly lift it. As in previous years, we tested our products on chicken. 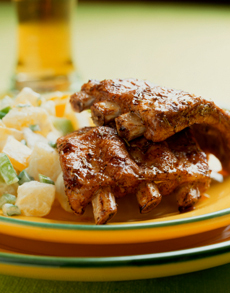 (See Part I and Part II for other favorites, including kosher and sugar-free barbecue sauce. )This year’s sauces that more than pass muster* are a widely-varying group of flavor profiles. Read each mini-review for details. *The phrase “to pass muster,” meaning to be acceptable or satisfactory, comes from the military. Troops are gathered in a group to show officers that they are acceptably dressed and equipped. Muster refers to the gathering, so it is especially appropriate for our gathering of barbecue sauces. Recognizing that preferences vary, we included some sauces this year that might not have passed our “moderate sugar standard” in previous years. You’ll see from our comments what we thought was good, and why people who look for sweeter foods should enjoy them. by Ed O’Neil | IST.